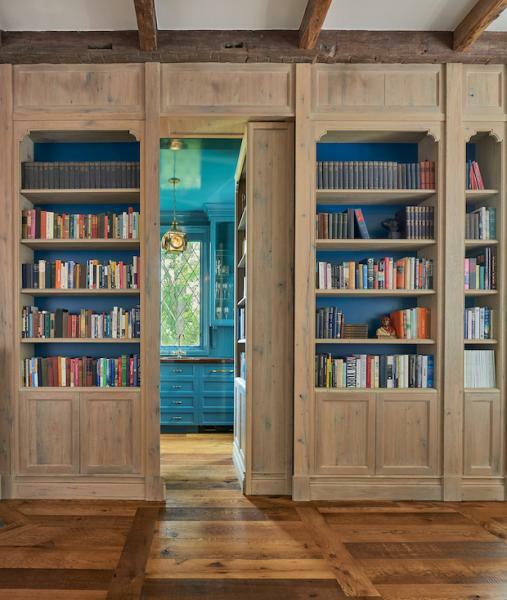 A hidden library door gives this new custom-built house the quirkiness of an old home. The library in this Chevy Chase, Md., custom home looks like something out of an old murder mystery, where a suspect is seen entering the room but never seen exiting. Inspired by French country architecture, the new home (a collaboration between GTM Architects and interior designers Solis Betancourt & Sherrill) features a low swooping roof, shed dormers, and clipped gables—hallmarks of the style. The clients asked the two firms for a new build that looks like an old home. “They were into quality over size,” says Paul Sherrill, a principal at Solis Betancourt & Sherrill, which designed the interiors, as well as the library door based on drawings by Rolando Valdez, a partner at GTM. “The homeowners wanted quality materials, and they love the quirkiness of old homes, so they wanted to include special things and create special places,” Sherrill says. Such spaces in the home include a custom skylight above a sweeping stairway, a groin-vaulted gallery hall, and a wine cellar rotunda. But it’s the library’s secret passage to a brightly painted blue bar area that’s especially clever. Measuring roughly 15 feet by 20 feet, the library functions as a place for family gatherings but also offers a way to create privacy. Paneled on all four walls with salvaged oak, it features built-ins and a beamed ceiling. The hand-planed floor—with its original nail holes—is fabricated from the same wood as the cabinets, but the designers specified a different stain to create a rich contrast. When closed, the library door looks like any other section of wall in the room—allowing nefarious butlers to escape undetected. PROJECT Private residence, Chevy Chase, Md. ARCHITECT GTM Architects, Bethesda, Md. INTERIOR DESIGNER Solis Betancourt & Sherrill, Washington, D.C. 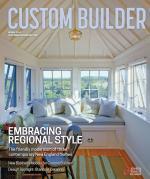 This story was originally published in the Winter 2019 issue of Custom Builder. See the print version here. Comments on: "Design Details: Hidden Secret"